Switch Disconnector fuse from 20A to 800A in 2P, 3P+N and 4P Versions. Switch Disconnector available from 63A to 1600A. Motor duty as well as Power Distribution Switches. Suitable for applications up to 690V AC. 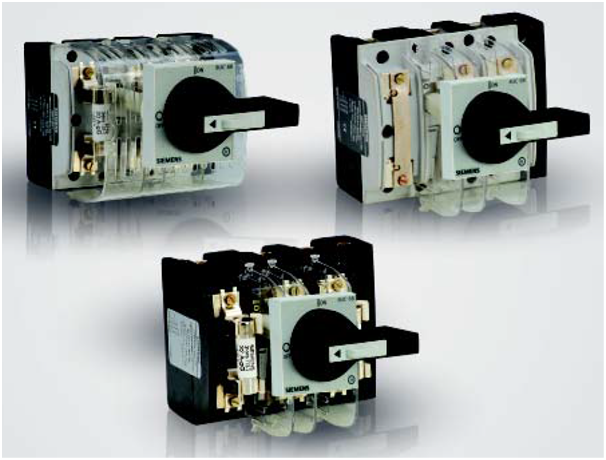 3KL8 Switches suitable for high temperature applications till 60°C. Isolable neutral as well as switched neutral pole. Increased safety through IP20 Fuse Covers and terminal cover. Suitable for Isolation as per IEC 60947. Unique Positive OFF indication to indicate the true position of contacts. Fuse monitoring provision via 3VU1340 fuse monitor. Type 2 Coordinated combination available for the entire range. Telescopic adjustable length shaft with rotary handle.